The most north westerly and one of the lesser known of the Canary Islands, La Palma is a diverse and surprising place, from the shoreline, up to the peaks at 2400m. The centre of the island is occupied by the Caldera de Taburiente National Park, around the sunken volcanic crater resulting in a rim 10km across, which in places, drops 2000m to the floor. This unique geological feature creates it's own micro climate with a large pine forest, deep and rugged ravines, narrow gorges, and waterfalls. Elsewhere, you will also find that this is a green island with fields and woodlands, making it an excellent place for hiking and enjoying the countryside. 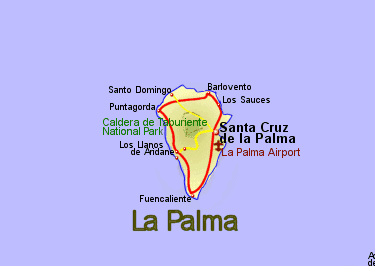 Santa Cruz de Tenerife to Santa Cruz de La Palma.